Lasyotsavam 2018 is scheduled on February 16, 17 & 18. This year along with the Festival Lasya Akademi of Mohiniyattam will be conducting a 3 days workshop by Guru Kalamandalam Sugandhi at the Natyagruham of Kerala Sangeetha Natak Akademi, Thrissur. Sungandhi Teacher will be training the participants a dance choreography and selected chapters of Natyasastra. 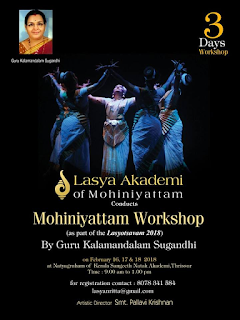 Dancers and dance students with Mohiniyattam background are welcome. Workshop participants will perform on 18th February after the distribution of the certificate. Programme details of Lasyotsavam 2018 will be published soon.